Search Results for "royal exchange"
LONDON, UK - 13 SEPTEMBER 2018: The busy road junction at Bank in the heart of the business and financial City of London district with the Bank of England and the Royal Exchange in the background. Royal Exchange, City of London, UK. with pull focus. 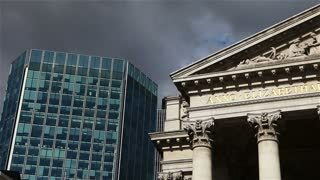 Revealing shot in slow motion of the entrance of the Royal Exchange building in London. Bank of England, the Royal Exchange in London, the UK. Financial and business heart. London Troops War Memorial in front of the Royal Exchange, London. Slow motion. Bank tube station, Royal exchange building, Double decker buses passing, financial district. LONDON, UK - CIRCA SEPTEMBER, 2017:Bank of England, the Royal Exchange in London, the UK with pedestrians and traffic, rainy day. Financial and business heart. Statues in Cornhill square and station of Bank of England from the Royal Exchange building. Historic restored footage on 1970s.